What Happened to Elegant Dining? When I was a teenager, I could not wait for The French Chef to come on TV each week with a new episode of cooking french meals. The Kennedys were in the White House with their French chef, and I loved reading about the elegant dinner parties they hosted. During the 60’s we were not worried about cholesterol and how many calories were in each dish. We just enjoyed good food and elegant dining – thanks to Julia! I could not wait until I was old enough to have a home of my own and begin entertaining. I dreamed of the day when I would be old enough to host my own dinner parties. After graduating from high school, most of my girl friends headed off to college. Not I – I went to Patricia Stevens Finishing School because I wanted to make sure that I was properly trained to be a gracious hostess . . . to walk properly . . to dress correctly. . . and most importantly to use the proper fork with each course at the elegant dinner parties I planned to attend and host. My first dinner party was for 30 people. I remember sending handwritten invitations by snail mail and people really RSVPed!! Remember those days? It was an elegant affair and people were seated all over the house. It did not matter that everyone couldn’t fit into the dining room. 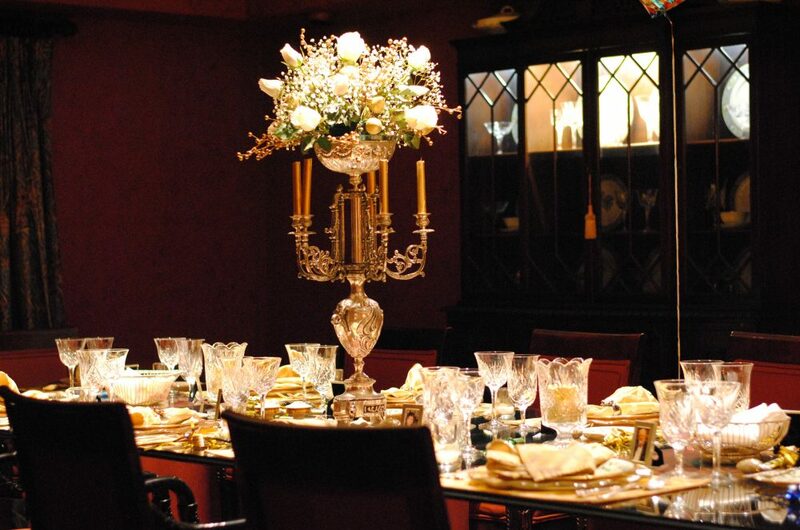 Each table was elegantly draped with fine linen and the tables were set with my fine china, crystal, and silverware. There were even place cards at each place setting! The menu was composed entirely of french crepes from the appetizers to the dessert. It took weeks to make all those crepes and freeze them so that I could fill them on the day of the dinner party. I made over 150 crepes! I can still remember the wine we served – Lancer’s Rose and Blue Nun. We thought it was fine wine back in the day! What a sense of accomplishment that was hosting my first dinner party! I then moved to my Annual Cold Duck parties at Christmas time. Everyone at the bank where I worked was invited along with their spouses to kick off the holidays at my home in the country. I purchased enough Christmas china to serve 30 people easily. Imagine – I had not learned of Martha Stewart yet and would not dream of using several china patterns. During the early 70’s, it was very popular to serve a sparkling red wine called “Cold Duck.” It went great with – you guessed it – duck a l’orange. It was quite an elegant affair and everyone was required to dress in their most festive holiday attire. I long for those days to return. Most of the invitations I receive these days are by text or email and they always say, “Casual Attire.” And wouldn’t it be lovely to watch a chef prepare an elegant dinner party on Food Network or The Cooking Channel? I think we all know how to do casual meals by now. I am so delighted when I receive a formal invitation to a sit down dinner where the hostess actually uses china, crystal, and silver! I long to bring elegant dining back. Let’s talk about cooking, entertaining, hosting elegant events. We will discuss wine and china patterns, and floral arrangements. Let the journey begin!